Gosh, I know it's been a while! I have had the itch to get back to blogging for the last couple weeks, but with the holidays and all, it just did not happen! I could sit here and type out this huge excuse as to why i have been gone from blogging for so long. The last post (I think) was in August or late July! So instead, of giving a bunch of excuses, let me tell you what has been happening in my life. I am now a little over six months pregnant! Work, health and my own education were put ahead of blogging, just cause they were all i could muster energy for! So with all that said, I'm back, but with a caveat. I won't be here as frequently. I just won't. There may be weeks that i am here more than others, but let me be honest. There's a bunch to life that shouldn't be seen just through my computer screen. It's a fun hobby, but it is not all that my life consists of. I hope that i haven't lost all of my readers/followers... I have missed the community as well and I am truly back because it is a really neat concept to chronicle your thoughts, feelings, happenings, etc. in blog format. Part of that includes interacting with the community as a whole. My hope is that you will continue to follow my inconsistent postings maybe even just 'cause you enjoy my random mumbles or even that you may like me! Heck, even if you might want to see a cute baby boy in a few months! A girl can hope right? So sorry about not having much posted during vacation! Don't worry, I'm not invisible! It turns out things got a little crazy before we left town and my plans to get posts written and scheduled, just didn't happen! I will explain more later this week! In the mean time, I do have some new stuff to show you... well you should already be looking at it at this point! Do you like the new look of this blog? I even added some social media buttons! I will be back tomorrow with a few shots from our vacation! PS Lee Lou Blogs is a great source for some really cute backgrounds and templates! This background was completely free! Love it! Oh and before I forget, I know a few months back I said i would be adding in teacher created materials for sale as well as changing the look of this blog. The change you see here today is not exactly what I had in mind, but finances aren't allowing me to spend $$$ on this blog. Also, I am just not finding the time to make anything for teachers! Life tends to get busy when we least expect it! While I am off gallivanting through Colorado, Meredith, from readyseteat.com has so kindly offered to share her thought on summer food! This recipe looks great and I can't wait to try it myself! Hope you enjoy! Getting tired of your summer recipes? As we head into the last full month of summer, you've probably had your fill of hot dogs, burgers and barbecue chicken. There’s absolutely nothing wrong with these classic meals—they’re easy, cheap and so delicious—but even the yummiest dinners can get a little tired if you eat them too often! Luckily, there are dozens of easy grilling recipes out there besides your plain old hot dog. Whether you use salmon or turkey in your next burger recipe or marinate your chicken in spices or pesto instead of typical barbecue sauce, there are lots of ways to make your average summer meals a little more interesting. This simple summer recipe calls for two of the cheapest and most popular easy dinner ingredients out there—pasta and chicken breasts—but uses them in a unique, ultra-flavorful way that you may not have tried yet this summer! With peanut sauce, soy sauce and lots of crunchy veggies, these peanut noodles and chicken skewers put a delicious twist on your average grilled chicken dinner. Best of all, this dinner can be ready in just half an hour, which is perfect for those nights when you’re pressed for time or it’s just too hot to be spending hours in the kitchen! To save even more time, make the noodles and sauce the night before so that all you’ll have to do at dinnertime is grill up the chicken; the noodles can be warmed up before dinner or kept in the fridge and eaten chilled. Spray the grate of an outdoor grill with grilling spray. Preheat grill to medium-high heat. Cook pasta according to package directions or until al dente. Meanwhile, whisk together peanut butter, water, soy sauce and ginger in a medium bowl until smooth. Divide peanut sauce into 2 bowls. Thread chicken pieces onto skewers; brush liberally with peanut sauce from 1 bowl. Grill chicken for 7 minutes; turn and grill for 7 more minutes or until juices run clear. Meanwhile, heat 2 tablespoons of oil in a 12-inch skillet over medium-high heat. Add stir fry vegetables and cook and stir for 5 minutes or until softened. Drain pasta and add it to skillet. Drizzle with the remaining 2 tablespoons oil; toss to combine. Add peanut sauce to the second bowl and toss together. Serve noodles with chicken skewers. Author Bio: This is a guest post by Meredith K. on behalf of ReadySetEat®. For this dinner and other easy chicken recipes to make this summer, visit www.readyseteat.com. A penguin getting tickeld?? Who ever heard of it? It is so darling! How's this for a prank! Let's end on that happy note! "I cannot believe it's August ALREADY!?!? Where does the time go?!?!" listening: there is nothing on in our apartment right now! Awesome! loving: We leave for Colorado on Thursday and have stops planned in Vegas, Zion National Park and Bryce Canyon National Park. Then off Colorado. On the way home we will stop at the Grand Canyon and then straight back to sunny so cal! thinking: packing, laundry, dr. appointment, hair apointment, blogging, Autism Authorization work, errands and more! Gotta get it all done! wanting: I have an itch to shop. I particularly would like a maxi dress or two, some new tops, maybe a few new pants or skirts.... just wanting to shop! 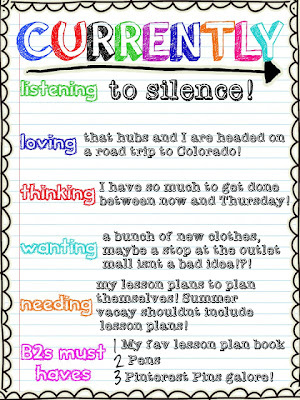 needing: I wish that my lesson plans would plan themselves! Summer is not the same when you have to crack something like that open at some point! And I have spent way too much time on my pinterest boards looking for things to add into my repertoire! Love that site! I makes teacher work a bit easier! There's my post for today! hope you enjoyed my currently! PS. In case I did not mention it before, I will be posting on the SoCal Blog 2x a week - Tuesday and Thursdays! Head on over now and check out today's post! Better yet, follow and visit regularly!